Miss Raymond 2014 has continued her winning ways and now wears the crown of Miss Deerfield Fair 2015. And Katie Masso-Glidden, 19, of Raymond, a sophomore at Keene State College who is pursuing a major in Occupational Health and Safety Sciences with a minor in management, said is thrilled with her most recent success. Even as a full-time college student, Masso-Glidden remains involved in many pageant events that lead up to the Miss New Hampshire competition. In her spare time when home from school she works at the Tuckaway Tavern and Butchery in Raymond, and during the school year she has a work-study job at the Keene State College information desk. And she is happy to add on to her schedule the responsibilities of her Miss Deerfield Fair title. Asked what prompted her to seek the Miss Deerfield Fair title, she responded, "My parents have taken me to the Deerfield Fair since I was a toddler. I have watched the Miss Deerfield Fair pageant for a number of years and had always hoped to compete one day. I was encouraged to compete by Miss Raymond directors Kathy Campbell and Lauren Campbell, as well as others in Raymond during my year as Miss Raymond. Miss Deerfield Fair is so close to home, and this year I decided - what better time than now!" Her duties as Miss Deerfield Fair mostly revolve around the fair itself. After being crowned at the fair on Friday night, she spent the next two days from 10 a.m. to 8 p.m. and from 11 a.m. to 6 p.m. respectively, attending activities and meeting people at the fair. "I handed out ribbons for horse shows, judged a goat costume contest, announced the pig scramble event, did the countdown for the demolition derby and took a lot of pictures," she said. "Because 2016 is the Town of Deerfield’s 250th anniversary year, I may have some duties that I have yet to know about revolving around the celebration this summer. Miss Deerfield Fair is part of the Miss New Hampshire organization. Because of this I will be present at many events that Miss New Hampshire is involved in. I will also attend other preliminary pageants to the Miss New Hampshire program as an audience member to cheer on the girls competing, and after the winner is crowned, meet and greet our new sister to the program. "Miss Raymond taught me interview skills, public speaking skills, helped me to be more confident on stage and in speaking with strangers,” she said. “I plan to take these skills with me as I continue my year as Miss Deerfield Fair and into competing in Miss New Hampshire in April. The Miss Raymond program is a great program for girls to get involved in to boost their confidence, meet other local girls, have some fun, and gain an understanding of how pageants work if they are interested in competing for titles and earning scholarship money for college." After competing in the Miss New Hampshire event in April 2016, Masso-Glidden is not sure what else the future will hold. "I am considering studying abroad for my junior year of college," she said. "If I do decide to study abroad, I won’t be competing in any other pageants until I return." Masso-Glidden considers community service to be important, and said that holding a title is a great way to be involved and volunteer with different organizations, something that helped her gain confidence and public speaking skills. 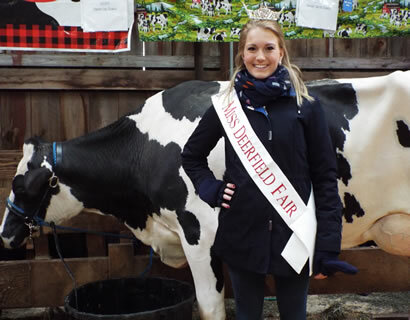 "Being crowned Miss Deerfield Fair is an honor,” she concluded. “I honestly could not have done it myself, no matter how cliché it sounds. I couldn’t have done it without my family’s support, especially my mom, who went above and beyond to help me get where I am. I also couldn’t have done it without the Miss Raymond directors. Kathy and Lauren have put, and continue to put, a lot of time and work into keeping the Miss Raymond pageant going. They encouraged me to compete in other pageants after my year as Miss Raymond was over. “I now have two new directors as Miss Deerfield Fair, Erin Brewitt and Jennifer Cully White,” she added. “They have already shown me how dedicated they are as well, and I look forward to the year to come. It has taken a lot of hard work and support to get where I am, and I still have a long way to go, but I can’t wait to compete with the other girls on the Miss New Hampshire stage in the spring."